Those who know me well from Twitter would probably (insert sarcasm) know that I have a weakness for shop photos. It all started back in early 2015 when I first learned about their existence with the release of Sakura. My Twitter timeline began to fill with images of the Arashi boys in all their glory; posing as a group, as a pairing, and individually. I was a trembling mess. I was new to the fandom even though I had been a fan since the year before. Out of shyness and sheer embarrassment, I dare not ask anyone how to actually go about buying them so I missed out. The pain my heart endured has never again seen the light of day because I was so devastated for missing out on Sakura shop photos, I vowed to never do it again. Eventually, I had to bite the bullet and ask people. Most were kind enough to point me in the direction I needed but that wasn't until the release of Ai wo Sakebe that I took my first giant leap into the shop-photo-buying frenzy. Why not AoKimi? I wasn't overly impressed with those shop photos I have to confess, except for a few group photos I just wasn't all that fussed with them. Ai wo Sakebe shop photos were different, and I had to have them at all costs. My obsession began in earnest. I have found a few Sakura shop photos since my early fandom days but they are few and far between. Most are snapped up by other eager buyers and the few that show up in sales or auctions I already have in my collection. It wasn't until recently that a dear Twitter friend went for a trip to Japan and found six Sakura photos for me. I was ecstatic and she will never know just how forever grateful I am that she went out of her way to seek them out for me (you know who you are THANK YOUUU!). As you can see from the photo above, I have several photo albums now. The three on the top right are filled with only Nino individual shop photos, as is the pink Johnny's album you can see underneath them. 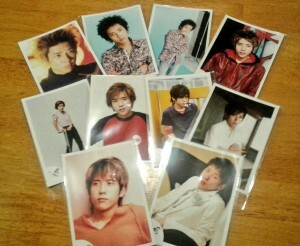 These contain photos from Nino's Johnny's Junior days as well as his early debut years. 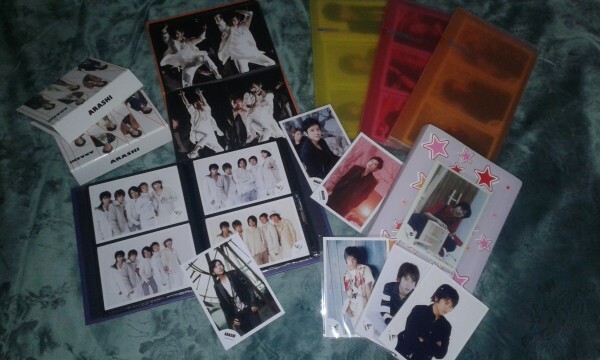 The two Arashi albums on the top left hold group photos and pairings. 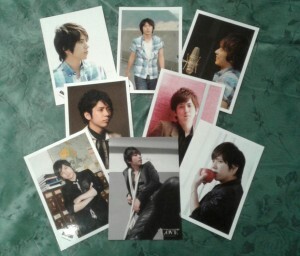 The album you see which has Nino's Are You Happy? papa photographs is an album dedicated to stage/concert photos. 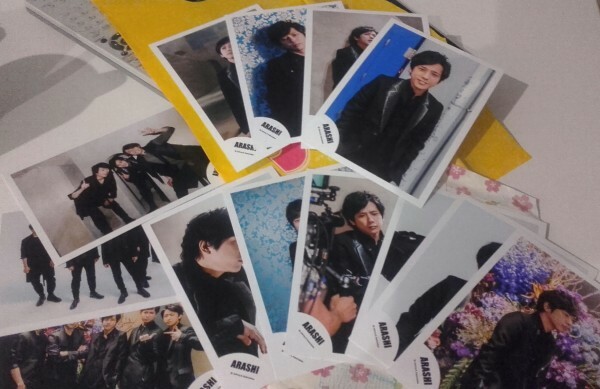 The album below it contains a mix of individual photos of Aiba, MatsuJun, Ohno and Sakurai and, as you can see from the photo, some early group shop photos and also some more recent group papa photographs.